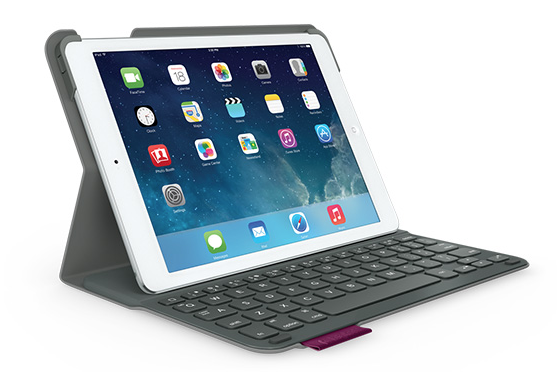 First in the Belkin lineup, the QODE Ultimate Keyboard Case for iPad Air is extremely thin and crafted of light, aircraft-grade aluminum for a matching feel and aesthetic with existing Apple products. 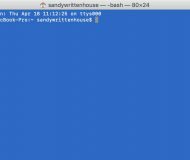 Most importantly, the keyboard uses a TruType key spread with responsive, accurate typing that gives a more spacious experience and includes iPad specific shortcut keys. The keyboard folds behind iPad when not needed to give the user one handed control of the unit. Three viewing angles lock iPad Air into place with dual neodymium magnets. The magnets prevent slouching angles or slipping during usage. To save battery power, the unit with auto on/off when users are engaging the keyboard, providing 264 hours of active battery life. Additionally, 4,300 hours of standby keep Ultimate going on the road and recharge with the included USB-to-micro-USB cable when necessary. Charging the iPad is also simplified with port cutouts for full accessibility. My wife uses this case on her iPad Air and really enjoys the extra productivity that comes with the Bluetooth keyboard. Additionally, the fixed angles make it a nice option for sitting on the couch without worrying about keeping the device held a certain way. 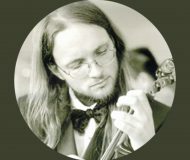 Jeff took a closer, in-depth look at this case and I suggest checking out his opinions. 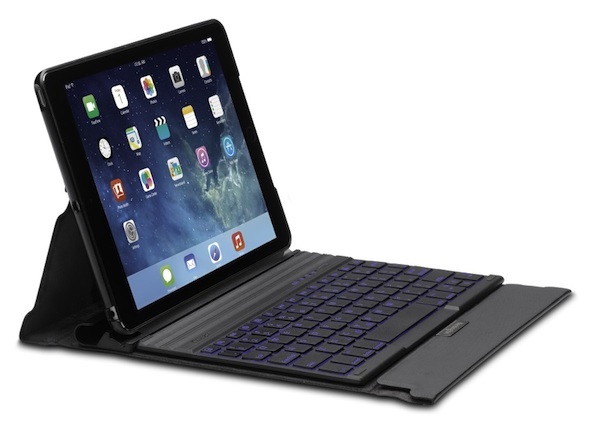 The QODE Ultimate Keyboard Case for iPad Air retails through Belkin for $129.00, and can be found on Amazon, starting at $90. 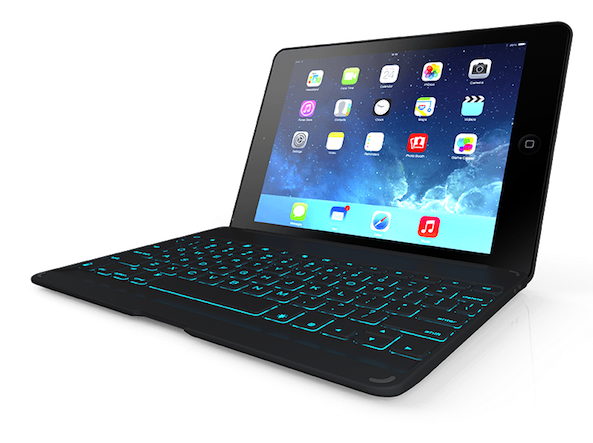 A unibody, anodized aluminum design, the Belkin QODE Thin Type Keyboard Case for iPad Air squeezes into a mere 4mm form factor. In addition to offering an ample TruType keyboard layout, the Thin Type doubles as a protective case, sliding easily into bags, packs, or purses. 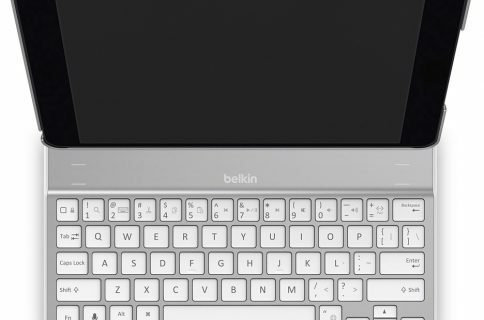 Like its brother, the Thin Type utilizes Belkin’s smart sensing technology to turn the keyboard on/off when necessary and utilizes iPad specific shortcut keys. Like an Apple Smart Cover, the Thin Type uses magnets to autowake iPad Air when the case is removed. Thin Type utilizes a fixed viewing angle of approximately 35 degrees, depending on how close the user sits to the unit. 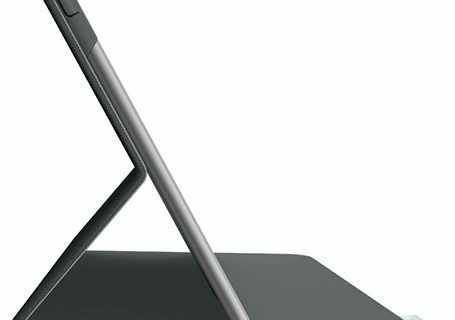 The slip is designed to hold iPad in both landscape and portrait orientations. When not being used, the back hinge secures the unit as the cover with additional magnets. The battery, even in the small 4mm design, will hold out for an estimated 79 hours, with 3,100 standby hours. The included micro USB cable provides the connectivity to recharge. 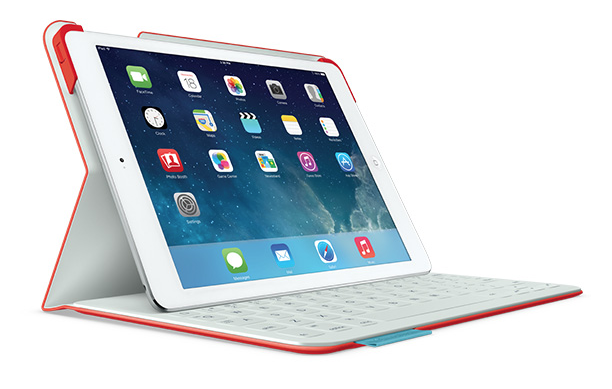 The Belkin QODE Thin Type Keyboard Case for iPad Air is available on Amazon for $99. 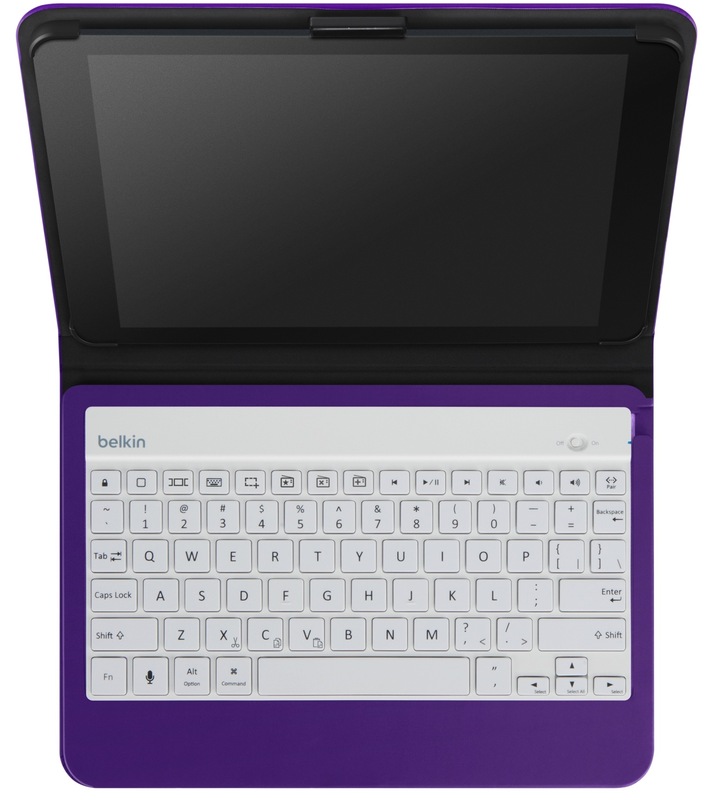 The Belkin QODE Slim Style Keyboard Case for iPad Air is a folio designed iPad case with a built in keyboard. With 5 colors to choose from, the folio can also be paired for a fashion statement or give a more personalized experience. While the Slim is a padfolio design, it still offers the same TruType, responsive experience of the other two members in the QODE line. 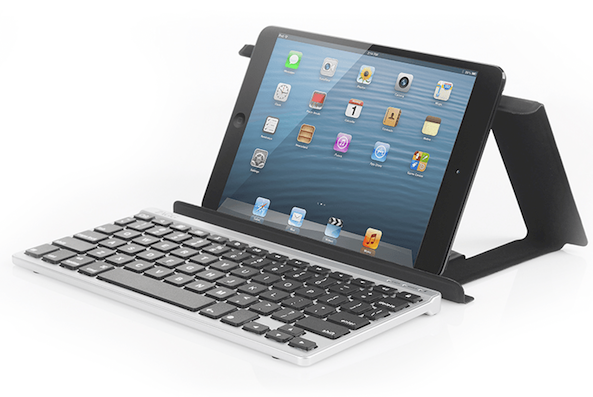 When not using the keyboard, it flips around, behind the iPad for easy reading or movie watching with one hand. For a propped viewing angle, a small stand comes from the back and operates at variable angles, depending on distance. 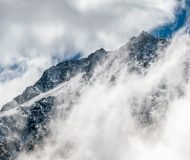 No preset angles are determined on this model. Considering the unit’s small size and focus on a padfolio design, there is no battery rating for this product, which makes me assume it is nothing too extreme. A USB to micro is included to recharge, as necessary. 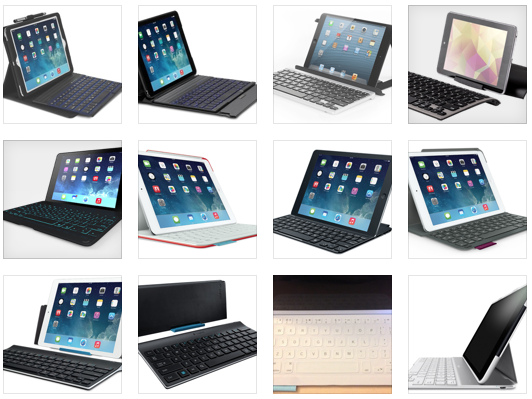 The QODE Slim Style Keyboard Case for iPad Air retails for $79.99 or starts at $67.00 via Amazon. Logitech, arguing its “on-trend” design, believes it “meticulously perfected” the FabricSkin Keyboard Folio, both inside and out. At .7 inches thin, FabricSkin weighs only 425g or .9lbs. 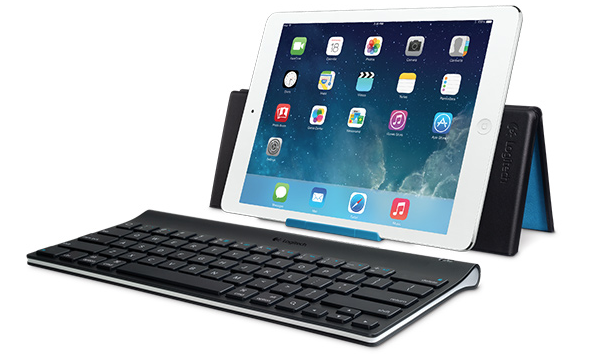 The Bluetooth keyboard is clicks like a true desktop experience and dedicated iPad shortcuts are included. However, this is not a true island-style keyboard design. Two-sided protection is provided in a folio style case with a built in SecureLock system that keeps iPad fastened to the frame. Additional security is found in magnets that keep the folio closed during transportation. The folio does limit the viewing angle to two options, upright or flat. 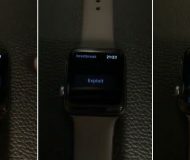 The internal battery is rated for 180 usage hours. 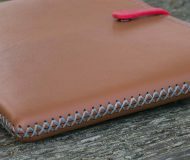 For more information about the FabricSkin Keyboard Folio, make sure to read Lory’s review. 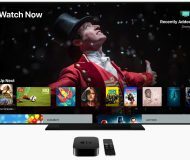 At $149 retail (with free shipping), this is an expensive option and no pricing relief is offered by Amazon. 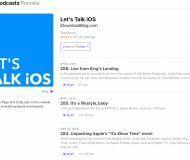 Again, making a bold statement that the Ultrathin Keyboard Cover is the “other half of Apple’s newest iPad,” Logitech’s thinner offering brings design from previous award-winning portable keyboards to Air. 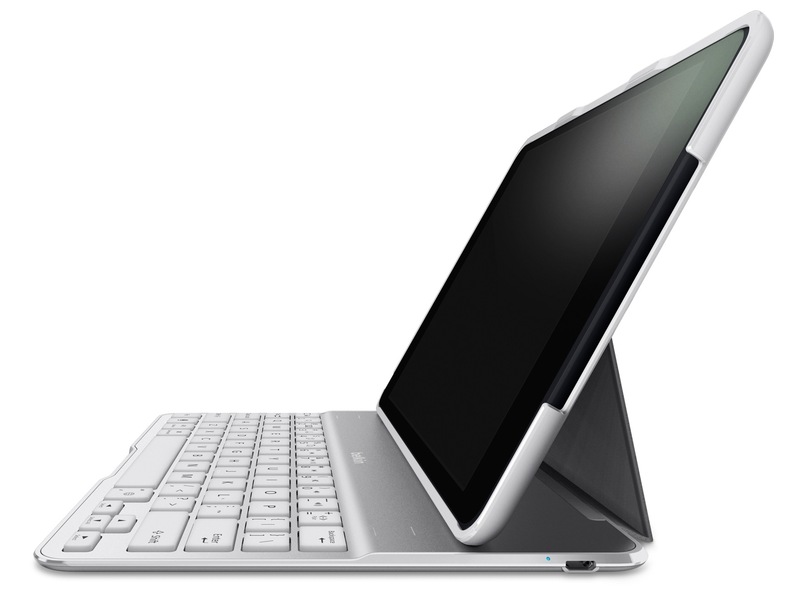 With a touch of Apple flair, the cover is aluminum and the keyboard is nestled on the opposite side. At 330g or .73lbs, the .29 inch Ultrathin is certainly living up to its name. Like other Logitech keyboards, the standard keyboard design is accompanied by iPad specific shortcuts. A magnetic clip works to match the iPad internal magnets, ensuring a proper seal, and the magnetic groove holds iPad at a designated angle for touching and viewing. The rechargeable onboard battery is similarly rated to the FabricSkin at 180 usage hours. The Logitech Ultrathin Keyboard Cover comes in at $99.99 retail (including free shipping) and similarly priced via Amazon. Seemingly, a combination of the Ultrathin Keyboard Cover and the FabricSkin, the Logitech Ultrathin Keyboard Folio is the same weight of the FabricSkin (425g or .9lbs) and essentially the same size (.09 inches thicker), the Keyboard Folio is a great choice for a more standard keyboard experience, with the folio design. iPad positioning is exactly the same, with both a standing and laying option. 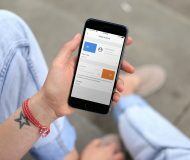 Battery life and accessories are the same and the SecureLock system is built-in. Although a combination device, the Ultrathin Keyboard Folio’s price is more reflective of the Cover than FabricSkin, at $99.99 retail (with free shipping), and the same on Amazon. 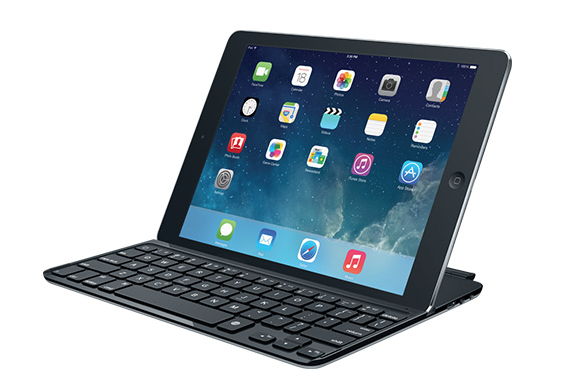 The Tablet Keyboard is not a folio or case, rather an external accessory that works with iPad Air. 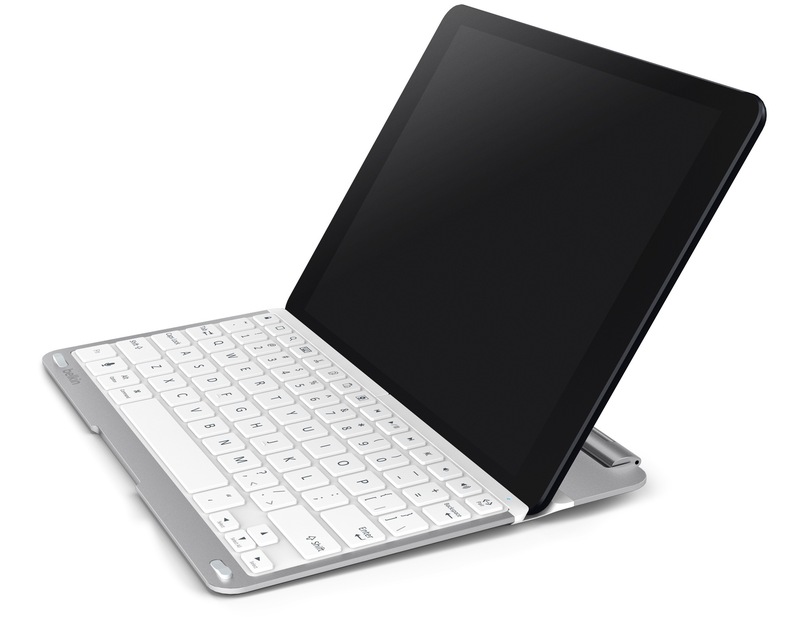 A small Bluetooth keyboard that travels inside a folded carrying case, the Tablet Keyboard also uses dedicated iPad shortcuts. Inventively, the carrying cases doubles as a folding stand for iPad, in either landscape or portrait orientations. Keeping everything tidy, the keys are low profile, both for portability and for easy storage, giving a mere 16mm depth. Interestingly, the unit uses 4 AAA batteries instead of a recharging LiON battery. The least expensive of the Logitech bunch, Tablet Keyboard is $69.99, or save a few bucks on Amazon at $56.45. Designed for iPad Air, this Bluetooth keyboard features island-style keys and up to 30% more typing space that some competing devices. With ZAGGkeys Folio with Backlit Keyboard at 7.6mm thin, travel is not restricted, considering it is one of the thinnest full sized offerings, close to the Logitech FabricSkin. 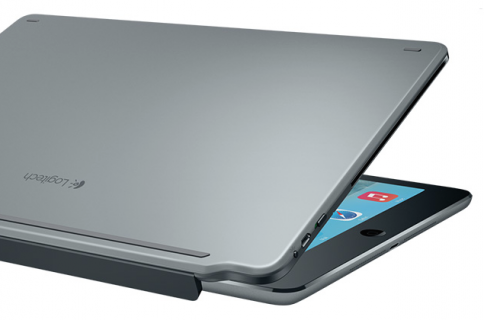 With laptop style operability, place iPad into the top encasing and the keyboard is below. 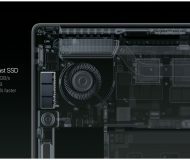 Opening the case is the same feeling as opening a MacBook Air and gives an installed look. The pivoting encasement also provides a full range of viewing angles. For lowlight situations, the backlit keyboard glows to light the way. Additionally, iPad shortcuts are included on the keypad. 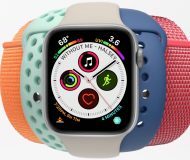 Rated at around 180 hours, the battery is similar to the competition, but the weight of the overall unit is slightly heavier at 535g or just over one full pound. 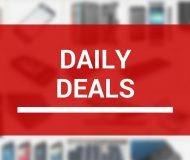 For the extra bells, the ZAGGkeys Folio with Backlit Keyboard retails for $99.99 (with free shipping), but no discount is offered through Amazon. The ZAGGkeys Universal Black Keyboard from ZAGG switches, literally, between Android, iOS, and Windows. The curved surface is deemed more ergonomic for a naturalized typing option. Island-style keys are similar to full sized keyboards, instead of recessed or covered with a material. Sliding into a travel case, the keyboard is easily portable and the case has a hidden tablet or phone stand built-in. At 294.85 grams or slightly more than .5lbs, this option is lighter than the ZAGGkeys Folio. With a rechargeable battery, the unit lasts approximately 180 hours. The ZAGGkeys Universal Black Keyboard has a reasonable buy-in at $69.99 retail (free shipping) or nab it from Amazon at $45. Like the Universal keyboard listed above, the ZAGGkeys FLEX Portable Keyboard and Stand is not specifically designed to hold an iPad. With a travel case that also operates as a stand, the FLEX is small enough to fit inside a jacket pocket and, at only 320 grams (11.3oz), will not bother the handler with weight. 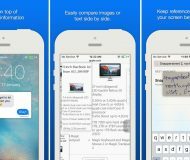 FLEX will operate with both Apple and Android specific functionality, including keyboard shortcuts. 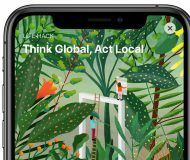 Like its brother options, island-style keys provide a familiar typing experience and the folding case keeps devices in either landscape or portrait mode. The typing angle is, however, a fixed angle, once the case is folded properly. Battery capacity is labeled similarly, at 180 hours on average. 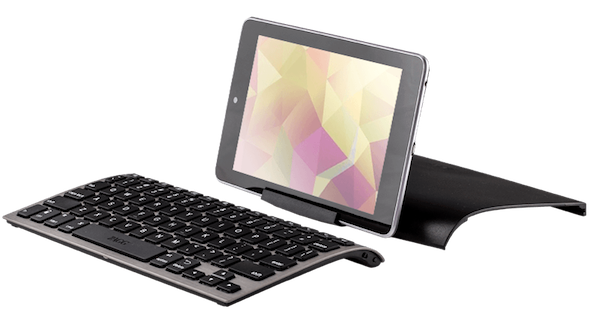 The ZAGGkeys FLEX Portable Keyboard and Stand retails for $79.99, including free shipping. Impressively, the Kensington KeyFolio Exact Plus Thin Folio with Keyboard includes dedicated locations to select different viewing angles for iPad Air. 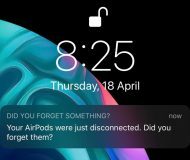 However, if necessary, the Bluetooth keyboard detaches from its magnetic housing, which provides limitless viewing angles and extra versatility. The folio case flap doubles back for a small wrist rest and the raised bezel protects iPad from scratches. Six rows of island-style keys give a laptop feel, including special keys, and the seven selectable backlight colors keep things fresh and well lit. Even the case comes in six colors. 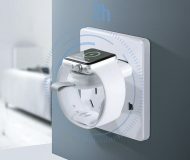 Part of the convenient design also includes a one-handed open or close and the iPad wakes or sleeps automatically. At 2.78lbs, this is not the lightest design, but many of the individual enhancements make this a contender. Bring the KeyFolio Exact Plus Thin Folio home for $149.99 retail, or score one for $127 via Amazon. 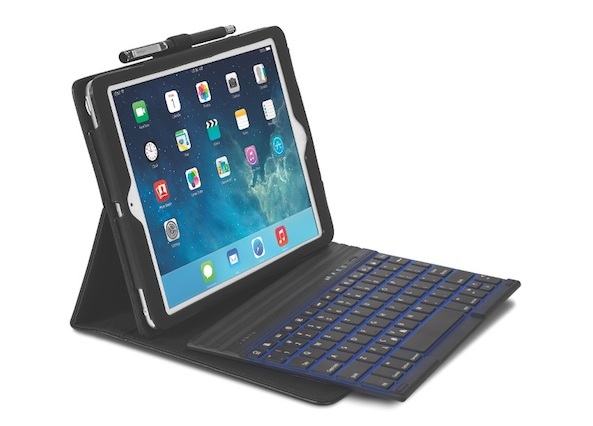 Seemingly, playing little brother to the Exact Plus Folio listed above, the Kensington KeyFolio Pro Plus Folio with Keyboard for iPad Air, uses a sliding installation instead of a shell style case. The Pro Plus has a harness attachment point for iPad Air instead of an encasement. Using the same six row, island keyboard design, Pro Plus also has seven selectable backlit colors. The biggest difference is the faux leather exterior, no wrist rest, and a lighter form factor at 2.15lbs. Pricing is also a factor, with KeyFolio Pro Plus Folio retailing for $119.99, or available for $99 from Amazon. As with every accessory, it’s hard to recommend one iPad keyboard over another because it really depends on what you’re looking for. Shape, weight, battery, keyboard style, and price are probably the five more important things you should look at when shopping for a keyboard. Ask yourself what is most important to you and make your decision accordingly. 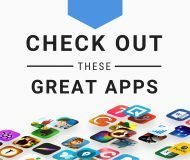 What do you look for in an iPad keyboard? Which one do you think would best fit your needs from our selection, and why?